On November 29th 2018, FabLab Factory organised a unique conference on the changing role of libraries in today’s digital society, this with a special emphasis on the integration of Makerspaces. 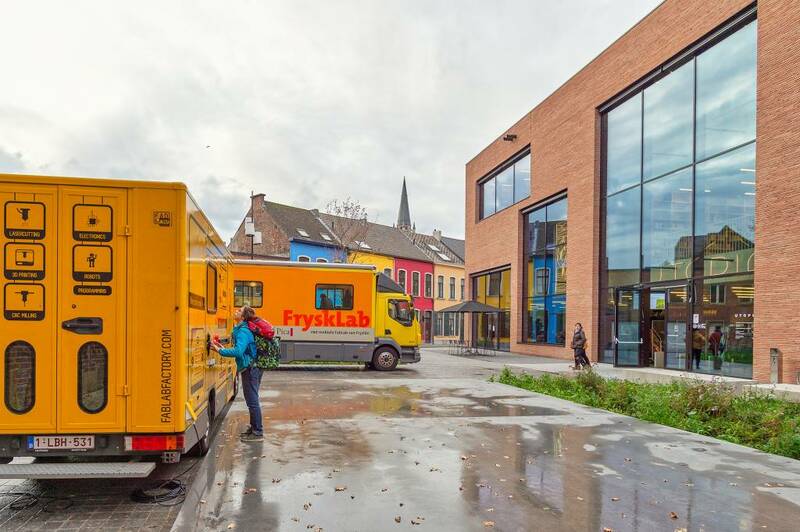 In collaboration with Frysklab, the library service of Friesland (a province in the Netherlands) and Utopia, the state of the art library of Aalst, we informed and inspired librarians from both Flanders and the Netherlands. With great pleasure we look back at this amazing day for those who missed out on this unique opportunity. Upon entering Utopia, both the public and librarians got surprised by 2 tables, fully equipped with all kind of digital fabrication tools that would soon be available for the public in Aalst to use. The devices included a laser cutter, a vinyl cutter, a vacuum former, a 3D printer, a computerized embroidery machine and a bunch of electronics. It was amazing to see how most visitors were immediately attracted by these high-tech tools, although they weren’t entirely sure what it all did and why for god’s sake these things were in a library. So, what if we say that soon you will go to a library to look for a vinyl cutter, 3D printer or some electronics to make your own creations? Wouldn’t it be amazing that the library not only offers a fantastic collection of literature, music and videos but also becomes a meeting place, a place that fosters creativity and where people come together to learn, to experiment, and to create with digital technology? Utopia, the public library in Aalst, is an exciting example of a library space that reinvented itself, organized around being a community center and a learning center rather than only being a book/DCD lending portal. It offers its community informal workplaces, a cafe, an academy for performing arts and recently integrated “FabLib”- a mini makerspace solution that brings digital literacy and digital technology into a welcoming and collaborative environment such as the library. FabLib is an all-in-one maker education package, consisting of all kind of digital fabrication tools, excellent learning materials, qualitative training programs, and support in the programming of make activities. An ambitious attempt to reinvent the library for its community’s needs. To celebrate this emerging chance, and in an attempt to inspire other libraries in Flanders and the Netherlands, FabLab Factory organised, on November 29th, in collaboration with Frysklab and the library of Aalst, Utopia, a unique conference on the changing role of libraries in today’s digital society, this with a special emphasis on the integration of makerspaces or FabLib. This unique conference got kicked off with an interesting discussion in which Luckas Vander Taelen (author, former politician and sympathetic enfant-terrible), Stijn De Mil (FabLab Factory), Jeroen De Boer (Frysklab) and Arnaud Van der Straeten (Utopia) engaged in a debate about the future of the library and the affinities between libraries and makerspaces. A perfect start of the day in which the librarians got a better understanding of the challenges of new technological developments that emerge continuously, the maker movement and FabLib. Given the enthusiastic reactions from the audience we decided to list the most striking facts. A video of this debate is also available on our Youtube channel. First of all, many libraries have faced drastic budget cuts in recent years but on top of that, a new Flemish decree has been implemented in 2016, saying that there is no longer a legal obligation to organize a library in a city or municipality. Is it reasonable to say that a library with 35 visitors with an average age of 85 let’s say, will no longer exist? The existence of many libraries is being questioned with this new decree. As a result, they are challenged to reinvent themselves and think beyond the library as a place for a collection and a traditional study environment with tables and chairs. Libraries have already been going through a highly interesting development over the years in order to attract new visitors. Giving access to computers, meeting rooms and so on, they are not longer defined by their collections. Luckas Vander Taelen said, “having an impressive collection is a very important part and books will never be replaced, but yet today, the library relies on other activities than just an impressive collection. More and more libraries want to profile themselves as a meeting place that supports education and lifelong learning, and this is only possible when people have free access to information, and new and advanced technology." This is where a makerspace makes its entrance. Makerspaces can be seen as places where collaboration and creative learning are embraced by making use of all kinds of digital fabrication. Jeroen De Boer has been working and communicating with a lot of libraries across the Netherlands and came to the conclusion that the maker culture fits naturally with the existing mission of a library. “Access and knowledge sharing have always been at the heart of libraries and these two things are also a key part of any makerspace.” Although, from experience he learned that most people don’t feel comfortable to just randomly step into a makerspace. Therefore, integrating a makerspace into a library can be a great innovative and welcoming way for users of all ages to learn how to confidently, safely and creatively use emerging digital tools. Stijn De Mil picked in on the latter “many libraries are already convinced of the social benefits of having a makerspace but often remain stuck in the practical implementation, partly due to a shortage of knowledge among the staff, partly due to the unclear abundance of possibilities.” In response to this need, he created FabLib, an all-in-one solution and maker education package for libraries, consisting of digital fabrication tools, excellent learning materials, qualitative training programs, and support in the programming of make activities. While FabLib got truly embraced by the audience, special emphasis was put on that fact that there is no one size fits all – concept, unfortunately. How a Fablib is incorporated into the library varies widely. Buying the tools is 1 thing but what’s next? During the debate it was clear that a big part of making FabLib sustainable is to ensure that libraries develop a project that meets a certain need in the community. However, in order to succeed you also need the right people. We can all agree that librarians are the greatest resources in a library. So, if the library needs to reinvent itself does that mean we have to push for a reinterpretation of the librarians’ role too? Jeroen De Boer says “if librarians get the right coaches, like artists or maker educators, who show them the ropes, who they can learn from, and who they can copy from, they will be able to successfully assist in programming make activities.” He goes on saying that implementing a FabLib is a long term project and making mistakes is part of the deal. So in the end it only comes to one thing, dare to experiment. A strong and motivational end of an interesting discussion. To continue, different hands-on workshops were organised throughout the day, making use of the different FabLib tools. To do so, FabLab Factory teamed up with Nerdlab, Ingegno, Design your City and Cultuur Connect. One by one experienced maker educators that gave a short and useful introduction on 3D printing, Vinylcutting, Lasercutting, and Coding & Programming with SamLabs, Strawbees and Microbit. The conference also wanted to provide in-depth insights, and thus, as libraries in the Netherlands have been faster to embrace maker education, Coda apeldoorn, who has relevant experience as a library makerspace was asked to give an interactive workshop about the best practices in The Netherlands. In this workshop Margot Appelman shared the experiences of Coda’s librarians in the process of transitioning from a content collection-only library to a content creation-inspired makerspace. On the other hand, makerspaces are rapidly being implemented in libraries and will probably soon be available in schools too. Therefore, Maakplaats 021 was invited to give insights on how to approach primary schools. Rob Van der Burg and José Remijn explained that, while schools that use STEAM education are often limited to only using the tools, due to lack of time and information, libraries open the doors for schools by developing projects that have an impact on the community and for which they need to make use of different digital fabrication tools to eventually develop the project. What makes libraries so powerful is that they enable pupils to experiment with technology, independently, without being tied to time. Also Jeroen De Boer and Aan Koostra from Frysklab - who take on a pioneer role in the Library makerspace movement - gave an interesting workshop about the makerparty, a three-day course for library professionals in which the librarians learn how to program make activities. Last but not least, different kinds of learning demands different kinds of physical learning setups. That is why the library sometimes prefers a solution that is flexible and mobile. Bart Bakker presented his Makercart, a mobile piece of furniture that is tailored to hold all FabLib-tools and consumables. Although, there was a lot of information to absorb, we have seen many inspired librarians. This day wouldn’t have been possible without our enthusiastic participants, great speakers and dedicated volunteers.